While a miscarriage of justice over the trial of Jean Claude Duvalier is currently occurring in Haiti, the United States is busy resuscitating its worn and failed case against another former Haitian President, Jean Bertrand Aristide. "Photo Credit - OAS"The year 2012 began with a degree of promise and optimism that Jean Claude Duvalier would finally stand trial for his role in committing crimes against humanity and for embezzling hundreds of millions of dollars from Haiti’s treasury. Such a trial would be the most significant human rights proceeding in Haitian history. It has the potential to end a long era of impunity, improve the performance of Haiti’s judiciary, and deliver justice to the hundreds of thousands who were victims of the former "President-for-life." Nearly four months later, the pursuit of Duvalier for human rights abuses has stalled and the media spotlight has shifted, notwithstanding piles of documentary evidence, direct testimony of victims, and forensic financial audits submitted to the Haitian courts. Haiti has an obligation under numerous international treaties it has signed to try Duvalier for crimes against humanity. But in late January, Judge Carves Jean announced that Duvalier will only face trial for charges of embezzlement. According to the January 25 Miami Herald, "lawyers estimated that Haiti's former dictator embezzled at least a half-billion dollars through an elaborate scheme of false companies, phony charities, and transfers in the name of friends and family." While this miscarriage of justice is currently occurring in Haiti, the United States is busy resuscitating its worn and failed case against another former Haitian President. On March 13, the Miami Herald ran an article titled "Miami Bribery Probe Zeroes in on Haiti’s Ex-Leader Aristide." The emergence of this latest case is significant, as it is a key step in the revival of a long and failed history of attempting to frame Jean Bertrand Aristide. It also raises the question why the United States is all but silent on Duvalier, yet wastes hardly any time in bringing charges against Aristide? The truth is that the United States has never stopped trying to go after Aristide, and on the other hand has never applied any pressure for Duvalier to face trial for his numerous abuses. This most recent attempt comes after a long series of failed attempts of bringing charges against Aristide in relation to human rights abuses, drug trafficking, and embezzlement. For example, in November 2005, 21 months after the second coup d'état against Aristide, the illegal regime of Gérard Latortue presented a RICO (Racketeer Influenced and Corrupt Organizations Act) lawsuit in a U.S. court, accusing Aristide of corruption and the embezzlement of tens of millions of dollars. The case was later withdrawn, but it succeeded in damaging the reputation of Aristide. Aristide’s present accuser is Patrick Joseph, the former director of TELECO, the former state telephone company. 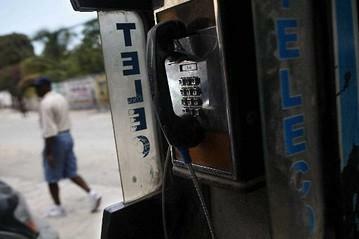 The Miami Herald reported that “According to the indictment, Official B and senior officials of Haiti Teleco, the telecommunications company owned by Haiti’s Central Bank, allegedly received payments totaling about $2.3 million from Miami businesses Cinergy Telecommunications and Uniplex Telecom Technologies.” "Photo Credit - Wall Street Journal"
In June 2003, Aristide fired Joseph from his position due to issues of corruption within TELECO. Last month Joseph negotiated a guilty plea with U.S. federal prosecutors for accepting $2.3 million in bribes from U.S. companies which fell under the Haitian anti-bribery laws and the statute of U.S. wire fraud. He currently faces a maximum sentence of 20 years. It has come as no surprise that he agreed to co-operate with the Department of Justice in order to receive a lesser sentence. Joseph’s plea deal can be accessed here. In addition to bringing another well U.S.-funded case against Aristide, such a movement shifts attention away from the important embezzlement case against Duvalier and accompanying calls for the charges of crimes against humanity to be reintroduced. It also reveals the dangerous double standard that the United States has in its relentless pursuit of Aristide, on the one hand, and its blatant disinterest in Duvalier, on the other. As previously stated, the trial of Duva­lier has the potential to be the most sig­nif­i­cant human rights case in Hait­ian his­tory—but the total absence of U.S. and other international assistance to the Haitian judiciary in prosecuting a case is damning. The U.S. obsession to contain Aristide in exile, or incarcerate him in the United States on corruption charges speaks volumes about their unease with him physically being in Haiti. Even Aristide’s lack of involvement in politics constitutes a threat to the interests of the United States. He has since reopened his University of the Aristide Foundation—which was shut down after the 2004 coup—and will continue to train medical doctors at no cost. In comparison, Jean Claude Duvalier has left a long trail of Swiss bank accounts, Ferraris, Miami condos, and jewellery abroad, and is now routinely breaking his house arrest and dining in expensive restaurants in Pétionville, an upscale suburb of Port-au-Prince. 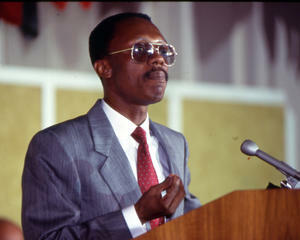 It is because of such flagrant abuse of human rights and interference in internal Haitian affairs that Aristide remains a powerful symbol for the broader fight for social justice in Haiti, and thus remains a thorn in the side of the United States and others who wish to profit off of Haiti's status quo. Kevin Edmonds is a NACLA blogger focusing on the Caribbean. For more from his blog, "The Other Side of Paradise," visit nacla.org/blog/other-side-paradise. Edmonds is a former NACLA research associate and a current PhD student at the University of Toronto, where he is studying the impact of neoliberalism on the St. Lucian banana trade.